Did various small tasks and cleanups today. Got a little bored so I tested out Monkey Bubble. Nice SVG graphics, cool tune and sound effects usin GStreamer. Perfect in my eyes in other words :). The sound seemed a little suboptimal though, with ‘lags’ here and there. I asked Ronald to test it out and see if he can figure out what is wrong, Monkey Bubble would be a nice showcase of GStreamer in games if it worked perfectly. If Ronald manages to get the sound perfect in Monkey Bubble I guess I should start pushing to have it included in gnome-games :). Or at least get Mathias to start packaging it in stead of frozen bubble. Anyway here is a little screenshot of the unpolished gem running on my computer. Noticed a nice feature of Red Hat bugzilla today. When you update a bug which is set to ‘needinfo’ it automatically gets set to ‘assigned’ again. In GNOME bugzilla this has to be done automatically and I have often seen bugs which the maintainer have forgotten about since its stuck in needinfo mode. 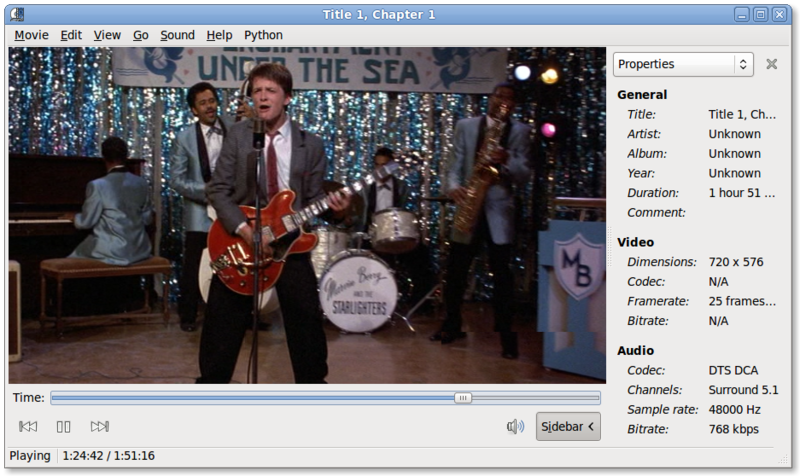 Tim-Phillip Mueller announced a webpage for his GStreamer based DVD ripper today. Very cool! Early stage, but still very cool. A new tool in FC3 is the network manager. Which for some reason I can not phantom has its binaries named with caps; like NetworkManagerInfo. I guess the tool is considered rather beta yet cause I have yet to discover anywhere in the menu or network tools on how to activate it, which I guess mean that unless you are not experienced enough to get it set up from the command line you are not meant to use it. Have a big plan for the weekend to get a haircut. Basically I haven’t cut my hair since I left Norway in June. Hope words like ‘poco’ and ‘medio’ will be enough to get a haircut within proximity of what I want. We did a new release of gst-plugins today. A bit after schedule due to the freedesktop downtime, but still a nice release. Chained Ogg support and the new polypaudio plugin for instance. In addition to a boatload of bugfixes. The release allowed Ronald to commit his backlog of patches, which among other things included surround support for selected GStreamer plugins and VCD/SVCD support. Done a few screenshots of Totem recently one which is the new sample image on gstreamer.net, and the second showing Totem playing a Flash file using swfdec. The polypaudio debate on gnome-desktop devel has flooded over into kde-multimedia. Was especially happy to see people there voicing concern over wether there was a polypaudio GStreamer plugin or not. Which coincided well with Scott’s interview where he also talks about GStreamer and KDE. A glorious moment today as my new living room furniture arrived from Ikea today. One step closer to having the perfect appartment. Now I have no excuse to not keep the place tidyer though. Saw the other day that Pamela Jones of Groklaw fame quit her job since she felt it was being used by SCO and MS to FUD linux and free software. That kind of dedication impress me. Gotten some complaints that I have not made any buttons or posters for my GNOME Foundation election campaign. I appologize to any potential voters who feel unapreciated due to this. If the puny piece of metal Nat got cost 18 000 USD, I am guessing becoming Wolverine is outside his budget. Also very happy to see interest growing around David Schleef’s liboil project. Ideally it could end up being used in swfdec, libcolorspace, libtheora and librsvg with current discussions. Went to the cinema with Thomas and Kristien yesterday to see the new Bridget Jones Diary movie. Johan and Wim are now convinced I have a mental problem since I didn’t go with Wim to see Aliens vs Predator instead. Spider replied in his blog to my review of Vendetta. While after reading his mail I think some of my criticisms, of the level system for instance, where based on inexperience with the game, my main criticism still stands. That the game is not very good at generating a feeling of a ‘living’ world around you. Which was something Elite where good at. I also think the game is so alike Elite in a lot of ways including setting and gameplay that comparing it to that game is more than fair. And while I can symphatize with the fact that they are a small company and can’t do everything at once, hey I work for a company with the same sort of challenge, I also feel it is fair to state what makes the game not entertaining enough for me, or at least not fun enough to start paying after my 8 hours of free play. I think the foundation is there though so I probably try again in some months to see how things have evolved. Both Inkscape and librsvg developers are working on improving font handling. Followed the librsvg debate most closely and getting font/text handling perfect will be a though job. Current questions in a librsvg context is wether pango is suitable or if not suitable can it be made suiteable, and if it is not suitable and can’t be made suiteable how can it be approached without Caleb and Dom getting an ulcer. A review of Vendetta Online. Vendetta Online is a commercial MMORG game available with a native Linux client (which is why I tried it out). It is basically a modern interpretation of David Braben’s classic Elite game. (which last incarnation has a Linux port. I ran that port recently (screenshot) since I used to love playing the game back when it was released. Anyway this review will look at how Vendetta Online compares to Elite. Obviously the graphics have moved a forward by a huge leap and same with sound. So lets start with the good points of Elite/First Encounters. The nicest thing of the game was its feeling of a huge universe which you had a real feeling of things happening in. A big part of this feeling of aliveness was the ongoing storyline presented through the various newspapers you could subscribe to. There where also a lot of quests which you could go on which tied in with these stories. There where also tons of quests which did not tie in with any background story of course. Another nice feature where the huge range of spaceships and how you could modify these ships with a lot of different accessories all with different tradeoffs in terms of usage of space and capabilities. The bad parts of Elite/First Encounters where the real lack of logics in regards to getting attacked. Space combat is fun, but it is not fun when you are getting attacked 50 times enroute to your destination. Space combat could also be rather tedious and borinng depending on which weapon you had. I also often got blasted out of the sky before knowing what hit me due to the ‘fast time’ option in the game. The motivation for those attacks where also a bit unclear as the monetary cost to any would be pirate would in most time make it cost prohibitive to be a pirate, meaning the value of your goods would allways be much lower than the cost of their repairs if you just got in 1 hit. The game also seemed to favouritize doing some rather boring stuff. For instance I quickly learned that the fastest way to earn enough money to buy the bigger cooler ships where basically fly back and forth between Earth and Alpha Centauri trading goods. This route where pirate free, short and the two systems complimented eachother well on what they needed. Bounty hunting, passenger transsport, military assignments and so on could be fun in their own regards, but they often cost as much as they gave in terms money for fuel and repairs. Another boring part of the game was the time spent flying to space stations and planets. You always warped in quite a way from the space station or planet in question meaning it took time getting to the planet. There was a fast time option which would have solved it was it not for often getting you killed before being able to react. So over to Vendetta Online. Have they managed to get the good things in elite over and the fix the bad stuff? Not so sure. Being an MMORG they have a good chance to make the Universe come alive around you. But the newspapers which where such an integral part of FFE is not there, newspapers which they could have both generated based on what players did and even probably get some players to help out writing. There are three grouping in vendetta just like there are in FFE, but they seem more stereotypical than their FFE counterparts. Being able to buy stuff has changed a lot from FFE, in Vendetta you need to get ‘licensed’ before being able to buy stuff. Not sure how much I like the concept compared to the pure pricing system of FFE. I think it makes it feel more like a game system than a ‘real world emulation’. To some degree the licensing system can be compared to the military assignments and leveling in FFE, but since everyone seems to be basically a ‘soldier’ for their respective group in Vendetta it means you have to work the ranks before being able to buy anything. Vendetta also has less spaceship customization options than its source of inspiration. So where FFE let you trade cargo space for protection for instance so are there little tradeoffs to be done in Vendetta. For instance FFE demanded you put aside space for a tractor beam/cargo scope if you wanted to grab cargo from ships you destroy, this beam would then grab the cargo for you in you where close to the cargo. In Vendetta this is just about ‘hitting’ the cargo boxes with your ship. Space combat do seem to have improved over its predecesor. It isn’t forced upon you all the time and the system for doing it seems aimed at making some more gameplay out of it. They have some nice improvements to trading, for instance so will prices start to fall if you do the jumping back and forth thing which I did with FFE. The trading system could still be improved, since they allow for universal communication they could for instance allow you to get information on good ideas for trading. I am sure that in such a future world there would be an organisation gathering prices from around the universe and selling you the information. Like a system where you could pay 50cr and be told that since you are on planet xy, you could consider these options which would earn you this or that. They do not however have the trading in illegal goods that FFE had which was another thing to bring flavour. Never tried mining in FFE so I am not sure how it compares to mining in Vendetta. Guess the comment is that Vendetta lowers the barrier for your first mining mission. Player vs player combat is of course a unique feature of vendeta since its a MMORG. When I was out flying on a mission I noticed an enemy ship in my sector. I tried attacking it, but I never seemed to get any hits. I didn’t recived any hits either. Seem to remember reading something about having to challenge people to be able to do that, which I think is a stupid concept, at least in ‘unregulated space’. So to summarize. Vendetta is a beautiful game graphically, and I truly recomend anyone to download the free 8 hour demo to test it out if nothing else to look at the beautiful rendering of space. The technics of the game like combat and space station handling are also good IMHO, but the developers really need to work more on adding stuff to add more flavour to the game, make the socities feel more alive and vibrant. FFE beats them hands down in this area, which is a feat considering how old the game is. Moving away from the license level/ working for the group system towards Elite’s system of free enterprise might also be a nice change. Managed to get my website w3c compliant for both the html and the css. Think the w3c will feel violated by that, but hey, thats life. The use of SVG and librsvg in games seems to be slowly growing. Learned today that the developer of Wormux is working on adding SVG support. This map map was made with Inkscape and will hopefully in future releases be rendered using librsvg inside Wormux. Tried working a bit on gnome-themes-extras today. But I am not able to get make dist working anymore. If anyone have a clue about it please mail me on uraeus-gnome-org. I am pretty sure it is a change in some underlying system as the g-t-e package has not changed its structure recently. Daniel linked to a fun little hack in his blog today. Sometimes I get depressed about the silly stuff the norwegian government does. Even now that I don’t live there anymore. Latest and greatest is that a Norwegian government agency has started a scientific study into wether earthworms feel pain or not. The reason for this seems because they wonder if fishing with earthworms on the hook can constitute sadistical behaviour towards animals under norwegian law……please can somebody please take away the budget of these people? Time has come for us to start pushing flumotion harder. Most people seem to get the latest version working easily and the flumotion.net website should be up this weekend at least. So next week I will start figuring out how to get as much attention as possible onto the server from people also outside the traditional crowd. One early goal is getting some of the radio stations streaming Ogg Vorbis to start using it for instance. Bastien was extremely quick to fix my latest Totem bug report. I requested support for drag and dropping url’s from the webbrowser into Totem, so that people could for instance drag and drop the Fluendo office URL onto Totem to test it. The day after my report the enhancement was implemented, thanks Bastien! I now have the l33t3st webpage since the golden era of Enlightenment. Found Jon Lech Johansen’s blog and homepage yesterday through Ronald. Seems he is hacking on a lot of cool stuff, like his screenshot showing windows media 9 or his tool to support streaming music to the applet airport express. Wonder what it would take to get him to work on his stuff in a GStreamer context :) Judging by his screenshots he is running GNOME with the Gartoon theme. Freedesktop being out of commison has kept us from making a new release of gst-plugins, which contains a lot of fixes for both playback and flumotion. A new release of gst-plugins is also a pre-req for Ronald to be able to release his video recorder application. As a comment I can’t help but feel the Linux Core Consortium smells for United Linux 2 with a little different branding.